Ichetucknee is an Indian word meaning ‘pond of the beaver.’ This park encloses the northern portion of the Ichetucknee River and its associated river swamps and Hardwood hammocks. Originating in a series of nine springs, the Ichetucknee River flows southwest for 9.6 km (6 miles) before it joins the Santa Fe River. 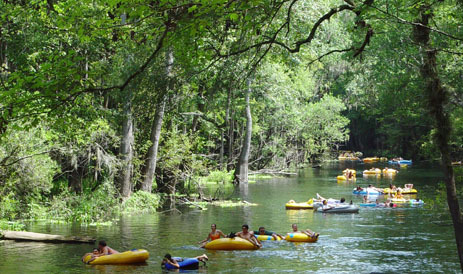 This exquisite little river has become one of the most popular natural attractions in Florida. During the months of June, July and August, thousands of people rent inner tubes and float downstream, snorkeling and swimming along the way. No matter how crowded it is, kids love the experience, and even grouchy old ecotravellers have been known to have a good time. During times of peak use only 750 tubers a day are allowed on the prettier, upper portion of the run, and it is best to arrive early in the morning. Avoid weekends at all costs. Outside the busy tubing season, this is one of Florida’s most beautiful canoe trips. Canoe and tube rentals are available from several local vendors.